The Yorskhire Terrier is a breed that was developed in the 19th century in the land of Yorkshire, England. The "Yorkie" was bred to remove the pesky rodents that were located in clothing mills. Upon its early creation, these dogs were once ranked as working dogs. They have since retired to a more house-friendly lifestyle and are often seen as fitting with the upper-class. 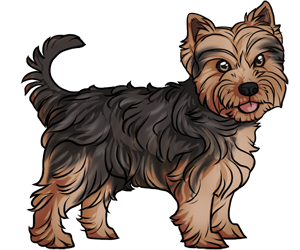 A dog named "Smoky" who served in the World war II era was of the Yorkshire Terrier breed. They were AKC recognized in 1885. Yorkies are prone to genetic disorders such as hydrocephalus, retinal dysplasia and distichiasis.